Unless folks know the country, it might not seem unusual to learn a grizzly was captured and released in Northwest Montana. However, the Salish Range lies between the “Northern Continental Divide Ecosystem” and the “Cabinet-Yaak” grizzly recovery area. Twenty years ago bear researchers hoped to find interchange of bears between the Cabinet-Yaak, and its small grizzly population and the much larger population in the Northern Continental Divide (Glacier NP, Bob Marshall, Great Bear, Scapegoat Wilderness, and surrounding country). They found none, neither in NW Montana nor northward in B.C. This is the first officially located bear between the two areas. 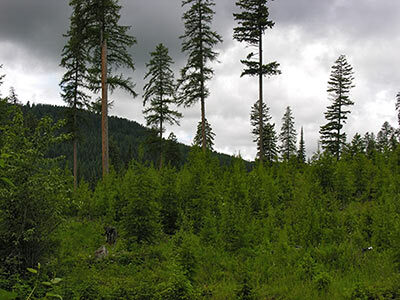 A regenerating clearcut in the thickly forested Salish Range, Montana. Read the about it in the Daily InterLake (Kalispell, MT). Article.